3 years after my husband & I eloped to Paris, I finally go my act together and ordered the drawing of the wedding gown I wore for the ceremony we had in Seattle a few months later. I LOVED the drawing that Debi Griffin of Illustrative Moments did right after we eloped! 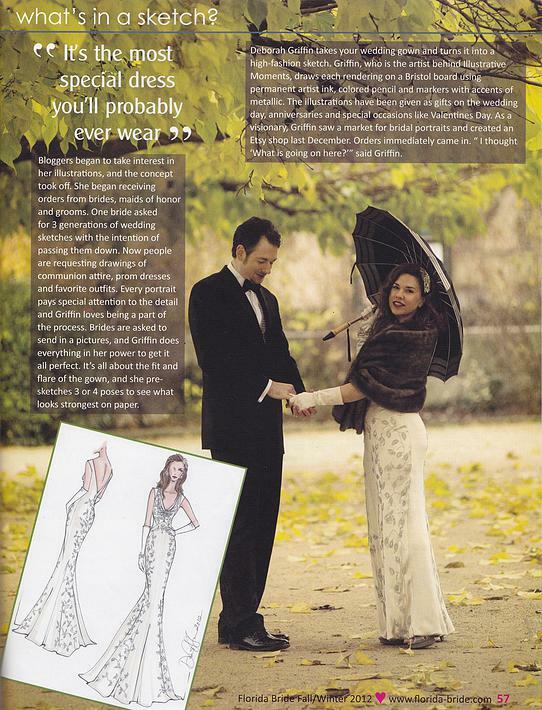 And I was super excited when the drawing and a photo of us outside Notre Dame Cathedral were featured in Florida Bride magazine. These custom drawings are so beautiful in person that the photo here doesn’t begin to do justice. The artistry is lovely and the detail she goes to make the drawings really reflect the bride are extraordinary – especially given they only cost $195-225. They are an amazing gift to give a special bride too. Motivation to order the ceremony drawing came from the re-do of my home office (which also doubles as my closet). I’ll feature some shots of it once it is further along. I will post the new drawing as soon a I receive it. Debi said she is really busy these days so it won’t arrive until some time in April.